In 2015, the Slovenian marque celebrated 50 years in the leisure vehicle industry – it started out as a caravan manufacturer in 1965. Since then, a consistently strong performance in export markets has helped Adria become the biggest single-branded motorhome maker in Europe. Key to its success overseas is a sharp focus on the needs of individual markets, and the robustness of construction methods that have to work in very demanding conditions – Adria motorhomes are very popular in Scandinavia, for example, where being able to function well at low temperatures is a must. Special silver-skinned ‘50’ editions of selected best-selling van conversion and coachbuilt models were the key plank of Adria’s half-century celebrations going into the 2016 model year, but behind the razzmatazz, the brand quietly slipped another couple of low-profile models onto UK forecourts for the new season. Matrix Plus bridges the gap between the entry-level Axess and top-level Supreme trims in Adria’s line-up of larger low-profiles. Like Axess, the Plus models ride on the Fiat Ducato (the Supreme models, like the Adria Matrix Supreme 687 SBC, are based on the impressive Renault Master). Price-wise, Matrix Axess ranges between £47,090-£54,090 OTR, while all three Supreme models cost £58,090 OTR. The two Plus models are priced at £56,090 OTR. To take a step up from the Axess ’vans, the Plus models get a window, an inner door bin and central locking in the habitation door, rear parking sensors, a height-adjustable, pivotable, freestanding dinette table on a floor-mounted base, full-framed habitation windows, rather than rubber-lined ones, handy LED lights in rear garage, 'running boards' under the cab doors, LED daytime running lights, a panoramic cab skylight, a 'media wall' (please see below for more details), an extractor fan in the kitchen, plus a sink cover/infill. The top level Supreme range brings desirable items like Alde heating and adjustable beds to the party. Adria has been an omnipresence in the UK for five decades, staying in the game while currency exchange rates may not have been particularly favourable, as is currently the case as a weak Euro and strong Pound are making European imports more affordable. Add to that the inclusion of the special 50 Year Anniversary Pack of extras and selected upgrades, which would normally cost £2000, and the Matrix Plus models will make a lot of sense for shoppers who like to buy Continental, but want a level of value for money to really push the prestigious German import brands hard. The Adria Matrix Plus 670 SC is a 7.48m-long low-profile coachbuilt with an L-shaped front lounge and a rear island bed. 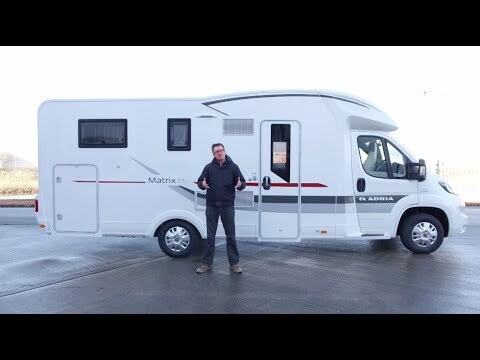 Launched in 2010, the Matrix range combines the spaciousness of overcab models with the sleeker lines of a low-profile, thanks to a distinctive hump over the lounge that has led some to label this kind of motorhome a ‘mid-profile’. Design changes effected during the 2015 upgrade to the sixth-generation Fiat Ducato chassis cab saw the front height of the Matrix reduced by 20mm to make it sleeker on the road and offer improved aerodynamics; at the other end, the rear height was increased by 60mm to give greater headroom in the bedroom. The habitation area utilises Comprex construction, which combines a wood, polyurethane and polyester bodyshell for durability and resistance to moisture, with insulation provided by Adria’s proprietary Thermo-build technology. This build technique carries a 10-year water ingress warranty, although Adria has a good reputation for build quality and robustness, as testified by regular Gold Award wins in our annual Owner Satisfaction Awards. Our test ’van was immaculate in white, with subtle silver, black and red side stripes, plus a curving line that followed the track of the roof hump. The front end is attractive – the gentle shape of the overcab moulding complementing the good looks of the new Ducato. A black radiator surround and chrome-effect skirt section under the registration plate add further sophistication. A single-piece moulded panel with horizontal road lights looks sharp, too. Our test ’van was supplied with a 2.3-litre Euro 5 turbodiesel engine with the standard 130bhp power output, but along a 35-mile mixture of dual carriageways, A and B roads, it put the power down well enough. An unladen weight of 3051kg would have helped with this, but the engine felt well suited to the vehicle, with plenty of power in reserve. Handling was assured, but sudden crosswinds and turbulence from overtaking lorries did make the 670 SC fidgety on occasion. And other than routine clatter from the grill pan, road noise was minimal, with very little to distract the driver – just as well, as no stereo had been fitted to our demonstrator unit, although there was a double DIN space for one. In total, five travel seats are fitted: in addition to the cab, two are found on the forward-facing lounge seat bench, plus a third belted seat on the offside sofa. Entering through the offside habitation door, the front lounge is built on a double floor so there’s a slight step up into it. Seating follows the familiar Continental configuration, with a transverse lounge seat, a ‘false’ nearside seat that removes in transit to give the third and fourth passengers some leg room, and an offside sofa. Rotate the cab seats and six people can gather around the substantial lounge table, which offers lateral movement via a catch on its underside. Our test ’van sported ‘Horizon’ trim – a darker, richer ‘Forest’ wood tone is also available. Seat fabrics were finished in the ‘White Santos’ cream and chocolate scheme – other options are available. The interior vibe is pleasing, with plenty of natural light able to enter via a combination of two side windows, a large over-lounge rooflight and a cab rooflight, plus from the cab. Overlocker ambient lighting is deployed throughout, plus a selection of LED downlighters, and two touch-sensitive LEDs on the B-pillar behind the driver and passenger. With their familiar V-shape, Continental galleys are certainly ergonomic, but the lack of extensive work surface favours tidy cooks who are happy to clean up as they go along. Food preparation can easily be accommodated thanks to the flat surfaces afforded by the cooker cover and sink infills; add some saucepans and plates to the mix, and things will get a little more cramped. Catering for two will, therefore, pose no problem; add some extra guests to the party and some efficient space management will be required. Kitchen equipment in the Adria Matrix Plus 670 SC comprises three gas burners, under a nearside window and its smart illuminated splashback, a deep but narrow sink with a mixer tap, and a combination oven and grill. Opposite stands a 150-litre fridge with a separate freezer compartment. An extractor fan is built in to the underside of the kitchen’s overhead lockers. Two double beds are available in the Matrix Plus 670 SC – a spacious island bed at the rear, above a rear garage, and an electrically operated drop-down bed above the lounge. Another single bed can be made up in the lounge, by lowering the table and rearranging the seat cushions, and measures 2.1 x 1.3/0.6m. With its walk-around bed frame, a pair of illuminated wardrobes and upmarket feel, the rear bedroom is the USP of this particular model (sister ’van 670 SL offers rear twin single beds). The bed measures 1.95 x 1.46m and has a light but comfortable mattress. Up front, the lounge bed measures 1.9 x 1.3/1.1m. It is lowered and raised by means of a rocker switch (no key required), and is quiet and brisk in operation. A ladder, which stows in the rear garage, is used for entry and exit. For more adventurous types, it’s possible to spring up into the bed by means of the cab seating. The bed’s load limit is set at 200kg. To save on body length, which stands at just under 7.5m, Adria has opted for a washroom split across the vehicle. The shower compartment is sited on the nearside, and uses a folding door and circular door combination to keep spray at bay. The 670 SC’s large 140-litre water tank should permit some decent length showering, for those who prefer on-board facilities to those on site. Opposite, on the offside, a sink, a vanity unit, a cupboard and a swivelling toilet ensemble form the rest of the washroom specification. A sliding tambour door is on call for privacy. The washroom area is large enough for dressing; further privacy can be facilitated by closing the sliding door between the kitchen and bedroom. With a rear garage (load limit: 150kg) accessible from both sides, plus drawers under the foot of the island bed, the Adria Matrix 670 SC is no slouch in the storage department. There are many other options, too, including a pair of wardrobes flanking the bed’s headboard, three overhead lockers in the lounge, two in the kitchen – where you’ll also find three soft-closing drawers, under the sink – and a selection of cubbies spread around the vehicle. Underfloor storage features, too, with a floor-mounted compartment next to the kitchen for keeping valuables out of sight. Another floor-mounted space, next to the bed on the nearside, loses a little space to plumbing equipment. The Matrix Plus 670 SC will meet the needs of most buyers when it comes to on-board kit. Space and water heating comes courtesy of an iNet-ready Truma Combi 4 unit, there’s a 150-litre fridge with separate freezer compartment, that electrically operated drop-down bed, a media wall (a recess next to the habitation door suitable for a small tablet or smartphone, with a USB point for charging) and a smart touchscreen control panel from Italy’s Nordelettronica. Water tank sizes are generous, with 140 litres (fresh) and 85 (waste). Extras fitted to our test ’van included the Drivers Pack (cab air conditioning, a passenger air bag and cruise control: £1699), and a spare wheel and holder. Units manufactured in model year 2016 received £2000 of base vehicle and other upgrades for free, as part of the 50 Year Anniversary Pack, including a panoramic cab skylight, fully insulated and heated water tanks, drop-in carpets for the cab and habitation areas, and a TV stand and bracket, plus the necessary connections for power and signal feeds. Adria knows how to build a quality motorhome and has a deserved reputation for sharp design and bombproof build. The Matrix Plus 670 SC will appeal to touring couples looking for the sophistication and practicality of an island bed, and a well proportioned washroom. Up front, the comfortable lounge and flexibility afforded by three extra berths will appeal to sociable buyers, although careful kitchen management will be required to feed larger parties. With a payload not far south of 500kg, and plenty of places to hide your touring essentials and extra kit, the 670 SC could also find fans among active-minded motorcaravanners. The only slight downside to this ’van is its pronounced rear overhang, which may give some users cause for concern on ferry crossings, and an overall length which, at 7.48m long, won’t fit on every front drive. And to see other Adria motorhomes for sale, click here.